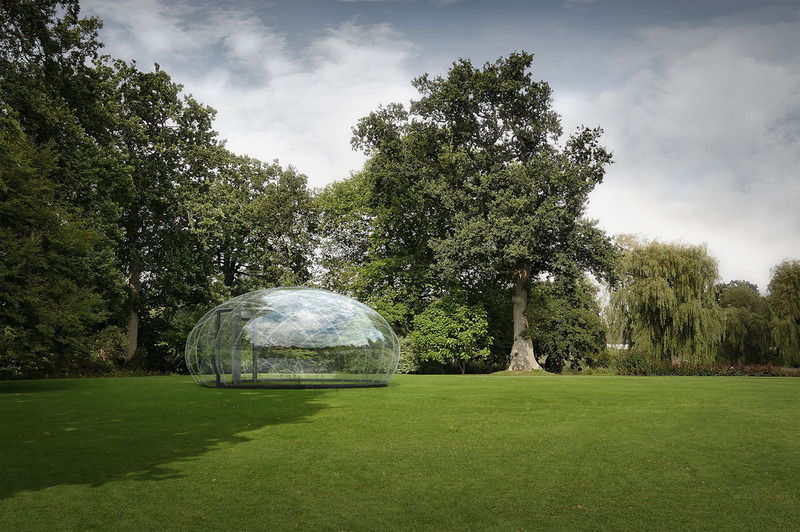 a transparent 25m2 greenhouse pavilion. 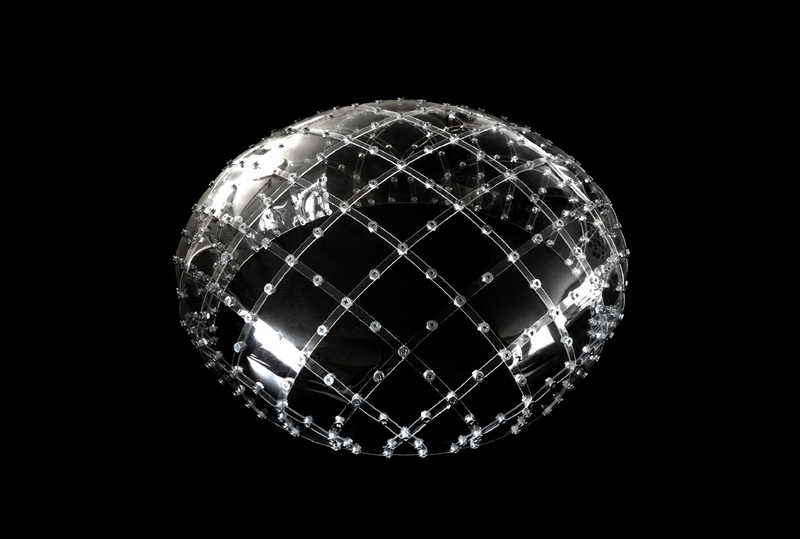 The droplet is a fully transparent pavilion resembling a resting water droplet. 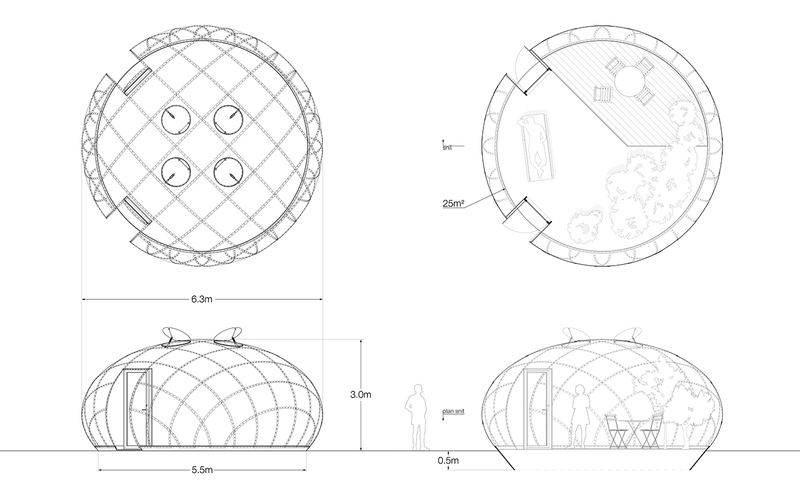 The structure is an engineered self-supporting dome, which can function as a garden pavilion, greenhouse, mobile exhibition, recreational space or whatever your imagination allows you. 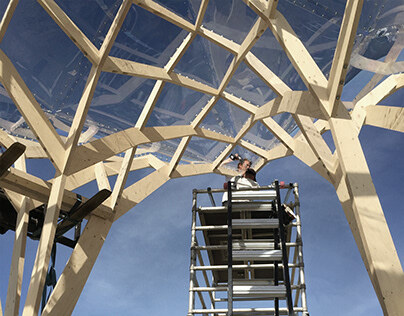 The droplet is born out of a desire to create a high-quality contemporary alternative to traditionally glazed greenhouses, though with the benefit of a sturdy and shockproof facade. The droplet consists of sheets in transparent 6mm polycarbonate sheets. The sheets are assembled with stainless steel nuts and bolts which allows for an easy and fast build and disassembly. 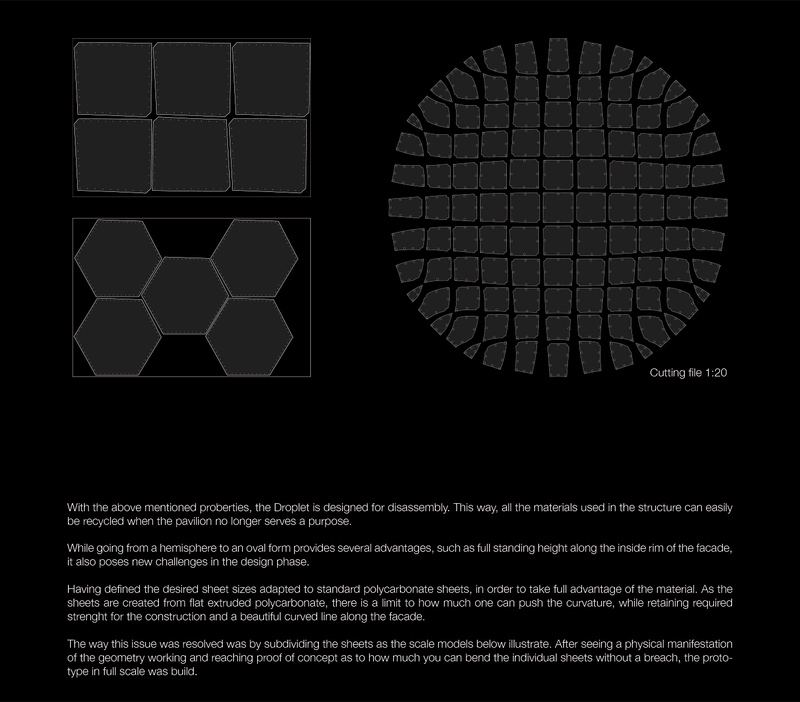 The curvature of the structure is generated by the rhombus shapes of the flat sheets and by displacing the holes slightly between the overlapping sheets in a controlled manner. In order to reach the required precision, CNC-milling is used for the sheets, which are also dimensioned to take full advantage of standard sized polycarbonate sheets from the manufactorer. The curvature of the facade gives the pavilion incredible strenght, which allows for the simple and thin facade without the need for internal load bearing walls or steel frames. With an oval profile and circular footprint the design maximises available floor space and standing height along the inside of the facade. The polycarbonate sheets are designed to overlap in a fish scale fashion, keeping the structure wind and waterproof, without the need for seals or caulk. The droplet can be tailored to accommodate each clients’ needs - from the type of foundation to size, shading, facade solution, transparency level and interior layout. The price of the droplet begins at DKK 94.000 but will vary depending additional acquisitions. 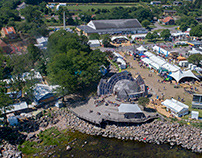 Please visit the homepage www.akt-droplet.dk to learn more about the project. To give examples as to how the droplet can be tailored, the droplet can be fitted with aluminium or wooden doors and a PEHD thermoplastic foundation ring extended 50cm into the ground to keep rodents at bay. Colors can be varied on the aluminium doors and the foundation. The primary choice for the facade is a 6mm UV-protective polycarbonate, but we can deliver polycarbonate facades in translucent U-channel sheets, solid sheets in variety of colors or even sheets in plywood. It is possible to add an awning to your droplet to provide shade on sunny days. The off white cotton awning will be available in several sizes and is easily attached to the droplet with stainless steel hooks on the inside of the facade. The same system can be used for a cotton tent, providing privacy and allows you to use the pavilion as a guest house. 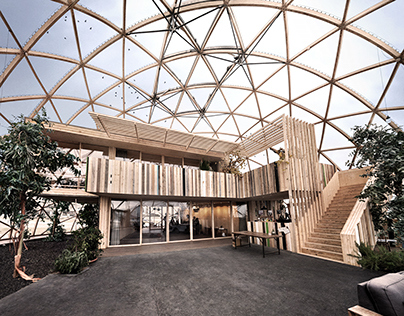 The droplet can be fittet with a base made of CLT (Cross Laminated Timber). The base consists of 3 interlocking pieces and ensures that the droplet is kept grounded during stormy weather and creates an instant flooring. 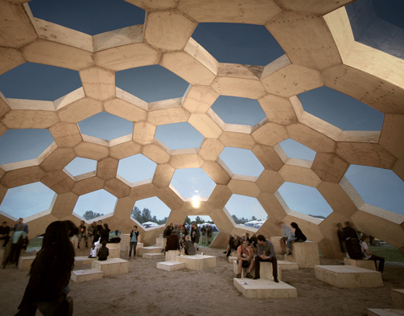 This type of foundation is an ideal solution if you wish to use the droplet as a mobile exhibition pavilion for commercial use. Everything we value in life requires maintenance and the droplet is no different. In the areas where the polycarbonate sheets overlap, algal growth will occur over time. 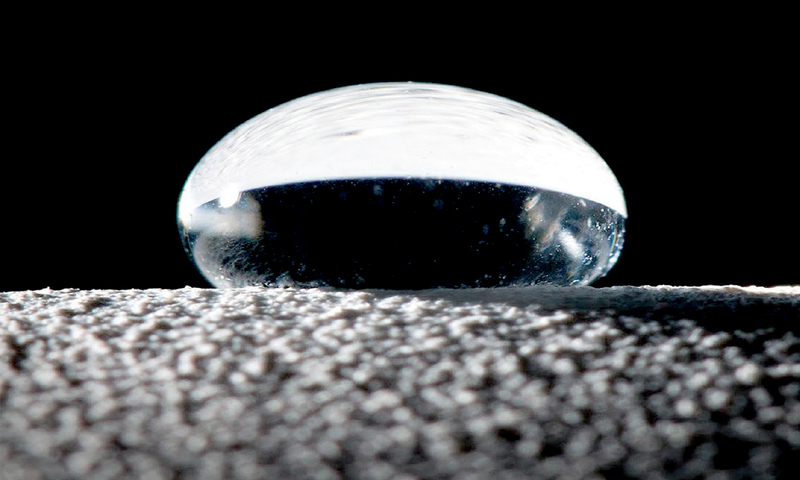 One way to reduce this growth is by conducting an annual cleaning of the droplet. Though, a possible solution is black rubber joint strips for the overlaps. This ensures that the overlaps of the sheets are perfectly waterproof and conditions for algal growth are eliminated. At the same time, the black rubber joint strips emphasize the geometry and can also be seen as an aesthetic addition to the droplet. Another way to address the issue of algal growth is by using transoms. With transoms it will be possible to customize the droplet’s appearance to individual preferences. With this addition it is possible to adapt the droplet to an architectural context. A variety of 12mm colored PEHD thermoplastic transoms are available or a solution with wooden heat treated ash transoms can be applied. 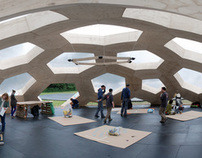 The droplet arrives to the building site on pallets, where the flat sheets for the facade contain an engraved number code system to ease the assembly process. The sheets measuring a maximum of 1x1m is easily handled by two people and even manageable by a single person. The sheets are joined together with a person on the inside tightening the nuts, as the person on the outside holds the bolts in place. No scaffolding or other heavy assembly supplies is nessesary. A ladder, a few simple handtools and you are good to go. Related to the contruction of Dome of Visions 2.0 in Stockholm, it was decided to erect a smaller pavilion at the Swedish Peoples Meeting, Almedalsveckan. 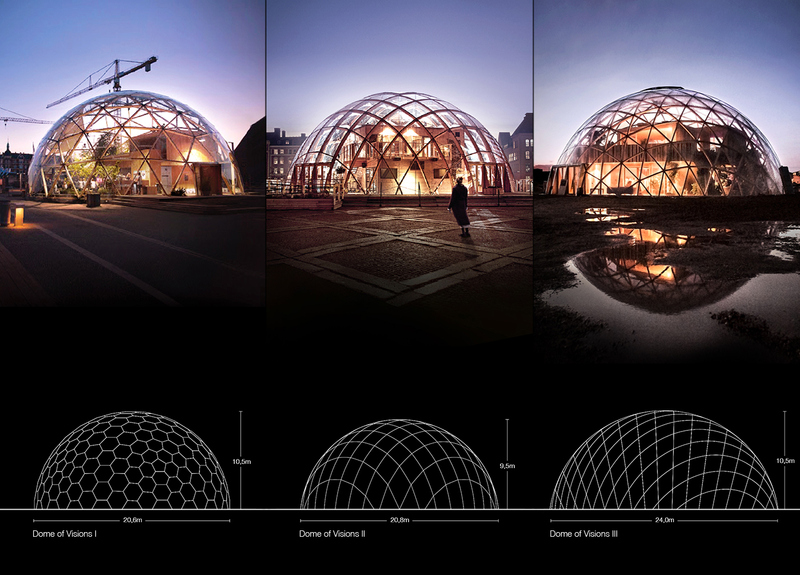 In part to announce that Dome of Visions now introduced itself in Sweden, but for the architect an opportunity to experiment further with the geometry of the dome, in order to optimize the design. 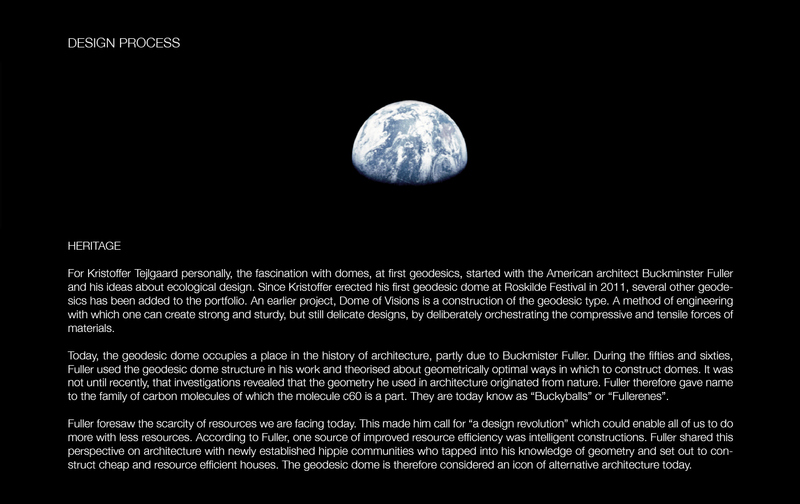 With the Almedal-dome, it was the first time the architect left the geodesic geometry that Buckminster Fuller revolutionized, in an attempt to optimize the geometry to the modern industri. 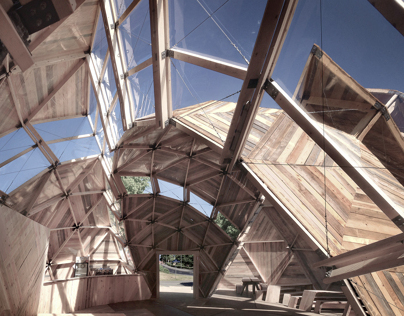 keep down the amount of material used on the wooden structure beneath the transparent facade, which is essentiel both in an economic and aesthetic light, the polycarbonate facade must be self-sustaining. 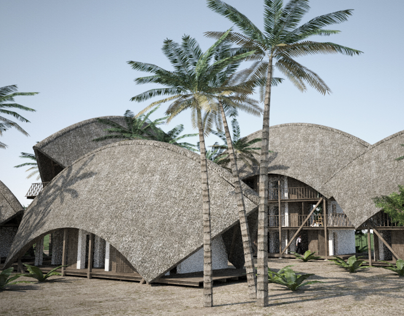 Through 3D-modelling the architect succeded in finding a geometry based on rhombuses, more suited for industrial production, in which the material waste could be reduced by 85%. At the same time, it was self-sustaining and was overlapping in a way that led the rain away and made it windproof. 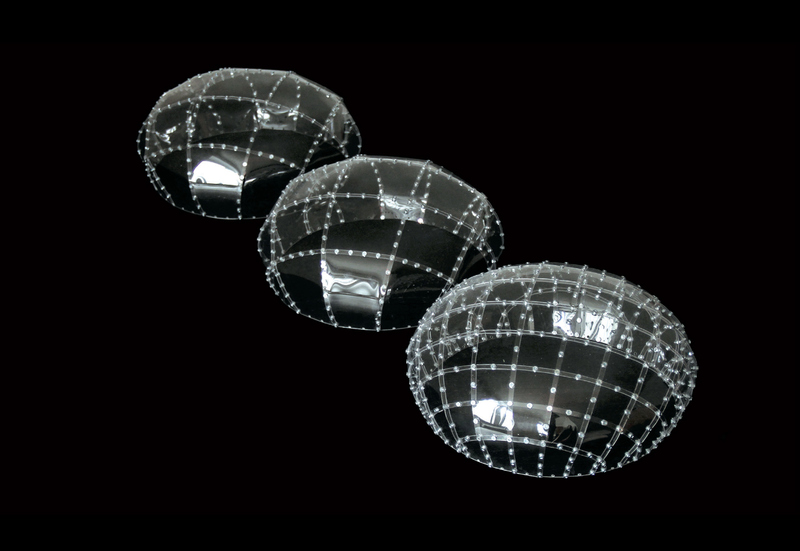 The experiment was at large a success, and here we had a good foundation for the continuing work with the geometry of Dome of Visions 2.0 in Stockholm. 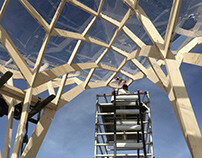 It was also in the work with the Almedal-dome that the architect first tried his hands at CLT, cross laminated timber. At the time a relatively untested material in Denmark. The were natural challenges with the manufacturing of CLT elements through the shape of a dome. We wished to challenge the manufactures, in order to learn how far you could go with detailing in shape and joints. Crumb doorways was developed, with joints and kerfs that lived up to the aestestic expression needed for the pavilion. If you made it this far, thank you for your time. Please follow us on instagram Atelier Kristoffer Tejlgaard to stay updated on future projects.